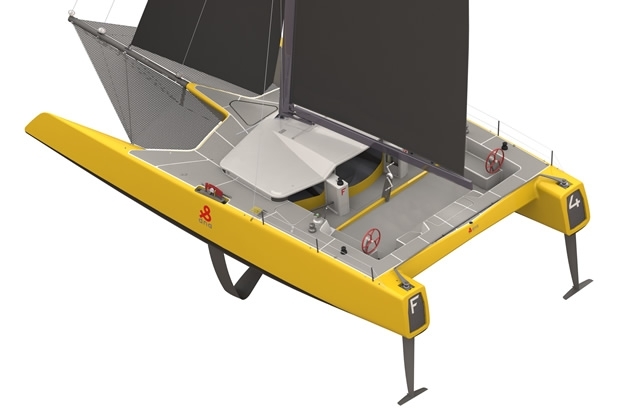 DNA has introduced its new F4 - an exciting full carbon 46ft foiling catamaran, designed and built to push the boundaries of distance one design racing offshore. Built in Lelystad, the boat is the result of an eight month design project spearheaded by DNA’s lead engineer and America's Cup/Volvo Ocean Race sailor, Shannon Falcone. The plan is to launch and commission the new boat in Newport, RI in the summer of 2016 and spend the remainder of autumn in New England testing the boundaries of the boat’s capabilities in preparation for a busy winter racing season in the Caribbean. “With the design cycle of the F4, the focus was all on performance and the result is stunning, a bigger and faster all-out racing machine which every speed freak should at least have a look at,” says Pieterjan Dwarshuis. Aimed at those looking for America’s Cup technology without the need for large shore crews and being washed from trampolines, the F4’s cockpit offers ample room for passengers in the heart of the action with a pilothouse providing sheltered area for long passages. In the same way that former A-Class world champion Mischa Heemskerk influenced the ergonomics and system development on the DNA F1, Falcone has been the technical advisor for the DNA F4.